Winter can wreck havoc on your property. Oklahoma winters are no exception to that rule. Pole buildings are a proven way to protect your property and your investment. Whether you are protecting valuable farm and business equipment or fun and sporting gear (boats, ATVs) a pole barn building can keep it secure from both the elements and trespassers. D Cross Barn Co offers custom pole buildings, designed to your specifications. We can provide a design drawing so you can see exactly what your building will look like when built. You can make sure the items you need to protect will fit conveniently and be appropriately covered. If you have a design ready, we can build it. If you have a design idea, we can bring it to life. If ground conditions or existing structures need to be worked around, we can do so. You don’t have to worry about making your new pole barn fit. D Cross Barn Co is experienced in meeting such challenges. We guarantee a sturdy and professionally built pole building that will protect your belongings from Oklahoma weather. We’re pole building experts and we welcome the challenge of turning your ideas and designs into a solid building. Contact us today. If you are need or want a pole barn customized to fit your life, D Cross Barn Co can help. Not only are they experienced in dealing with various challenges (terrain, existing buildings, weather, and more) they provide quality service. Have you heard horror stories about pole barn contractors who took months to build structures only to have them leak (or worse) once finished? You’ll get only good results when you use D Cross Barn Co. Our plans help insure the building you are dreaming of is the one you are going to get. Once underway, our project managers keep your pole building project on time and on budget. You won’t find low quality material on our building sites. We only use material that meets or exceeds product standards. Our professional contractors do quality work. You can be proud of the result. Whether you need a building idea brought to life or need help deciding on the perfect building for you, contact D Cross Barn Co. today. We’re family owned and operated, taking pride in every pole barn we put up. 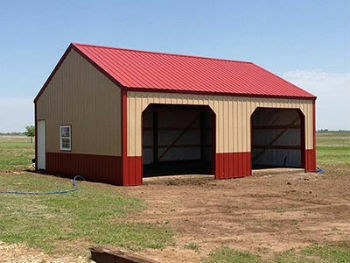 Call us today and we’ll help you get your Oklahoma pole barn project started.